The Innovative Mobile Bumper Storage Rack is a mobile storage solution that is perfect for any collision service and body shop. Whether you need bumpers stored in the parts room or by a paint booth, this bumper storage rack offers the flexibility and durability that you expect from Innovative Tools. This storage rack holds up to eight large bumper covers and has eight extra-long arms for over sized bumpers. The support arms are fully adjustable in 3 inch intervals to meet your exact storage requirements. Our high-carbon, heat-treated steel construction ensures that this bumper rack will hold up even under the toughest conditions. 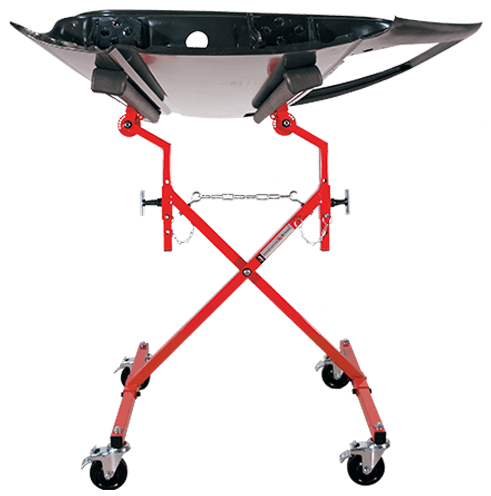 We recommend one Innovative Mobile Bumper Storage Rack for every 3 body technicians in your shop.